Canada Day (French: Fête du Canada), formerly Dominion Day (French: Le Jour de la Confédération), is Canada's national day, a federal statutory holiday celebrating the anniversary of the 1 July 1867 enactment of the British North America Act, which united Canada as a single country, which was in turn composed of four provinces. Canada Day observances take place throughout Canada as well as internationally. Frequently referred to as "Canada's birthday", particularly in the popular press, the occasion marks the joining of the British North American colonies of Nova Scotia, New Brunswick, and the Province of Canada into a federation of four provinces (the Province of Canada being divided, in the process, into Ontario and Quebec) on 1 July 1867. Although Canada is regarded as having become a kingdom in its own right on that date, the British Parliament kept limited rights of political control over the new country that were shed by stages over the years until the last vestiges were surrendered in 1982 when the Constitution Act patriated the Canadian constitution. 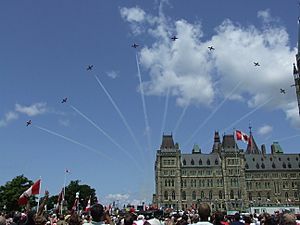 The Snowbirds on Canada Day celebrations in Ottawa. Queen Elizabeth II and then Prime Minister Jean Chrétien, at the official Canada Day celebration in Ottawa, 1997. 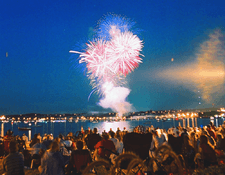 Most communities across the country will host organized celebrations for Canada Day, usually outdoor public events, such as parades, carnivals, festivals, barbecues, air and maritime shows, fireworks, and free musical concerts, as well as citizenship ceremonies for new citizens. There is no standard mode of celebration for Canada Day; professor of International Relations at the University of Oxford Jennifer Welsh said of this: "Canada Day, like the country, is endlessly decentralized. There doesn't seem to be a central recipe for how to celebrate it– chalk it up to the nature of the federation." However, the locus of the celebrations is the national capital, Ottawa, Ontario, where large concerts, presided over by the Governor General, are held on Parliament Hill, as well as other parks around the city and in Hull, Quebec. The sovereign may also be in attendance at Canada Day celebrations in Ottawa; Queen Elizabeth II was present in 1990, 1992, and 1997. The Queen also helped celebrate Canada's 100th anniversary on 1 July 1967. Under the federal Holidays Act, Canada Day is observed on 1 July unless that date falls on a Sunday, in which case 2 July is the statutory holiday, although celebratory events generally take place on 1 July even though it is not the legal holiday. If it falls on a Saturday, the following Monday is generally also a day off for those businesses ordinarily closed on Saturdays. Canada Day Facts for Kids. Kiddle Encyclopedia.